Ottawa Citizen Headline: Snow, originally uploaded by johnwmacdonald. 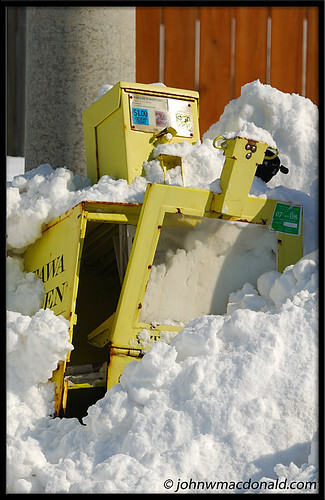 A rogue snow plow apparently did some damage to a row of three newspaper boxes on Shoreline Drive in the Riverside South area. The Citizen's box took the brunt. As of this afternoon, much of this community's residential roads are limited to only one narrow lane of traffic. Ah, how I miss Ottawa! The crocuses are blooming here, John.